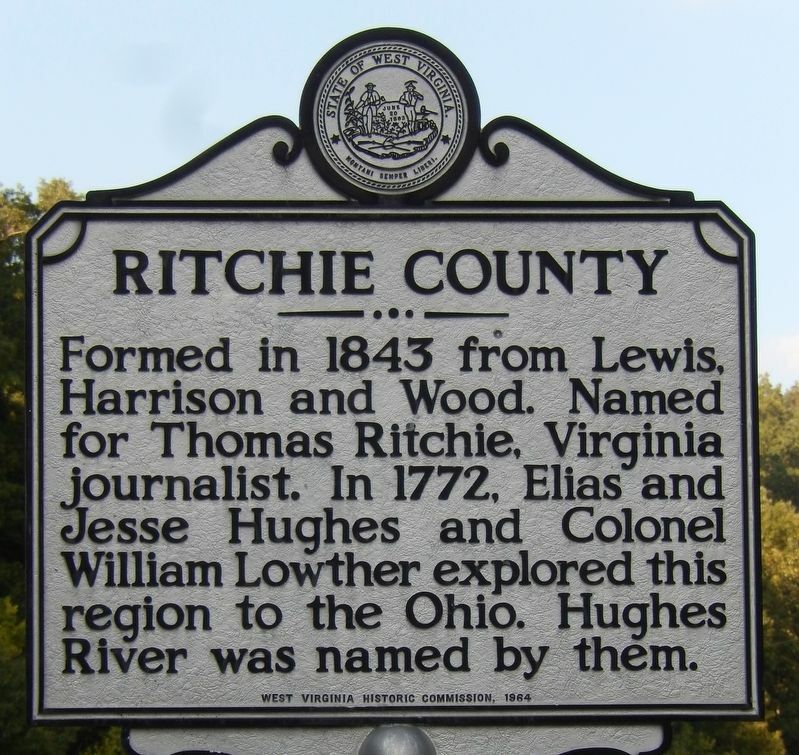 Ritchie CountyFormed in 1843 from Lewis, Harrison and Wood. Named for Thomas Ritchie, Virginia journalist. In 1772, Elias and Jesse Hughes and Colonel William Lowther explored this region to the Ohio. Hughes River was named by them. Wirt CountyFormed, 1848, from Wood and Jackson. Named for William Wirt, who was prominent in the prosecution of Aaron Burr. 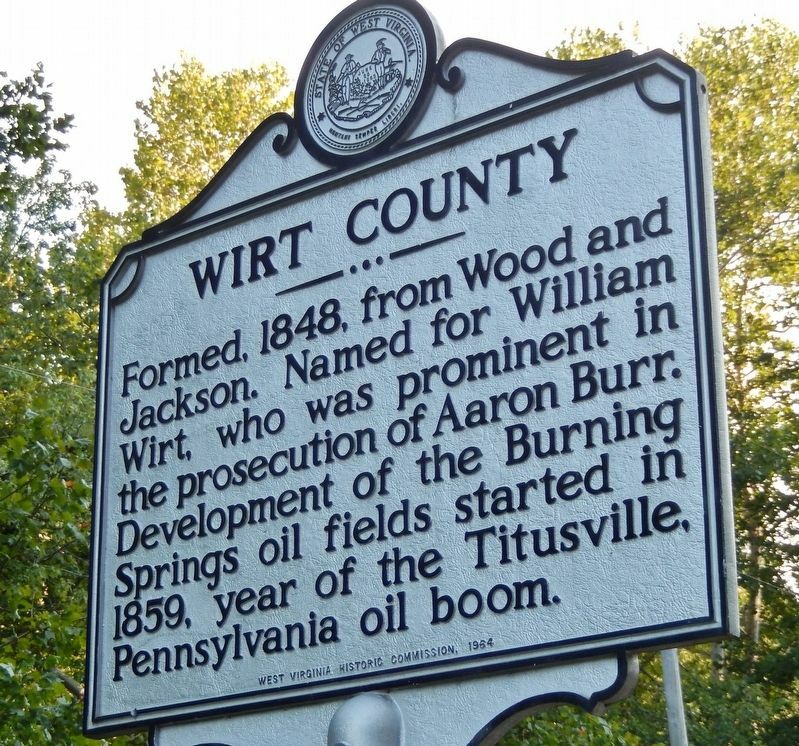 Development of the Burning Springs oil fields started in 1859, year of the Titusville, Pennsylvania oil boom. Erected 1964 by West Virginia Historic Commission. Location. 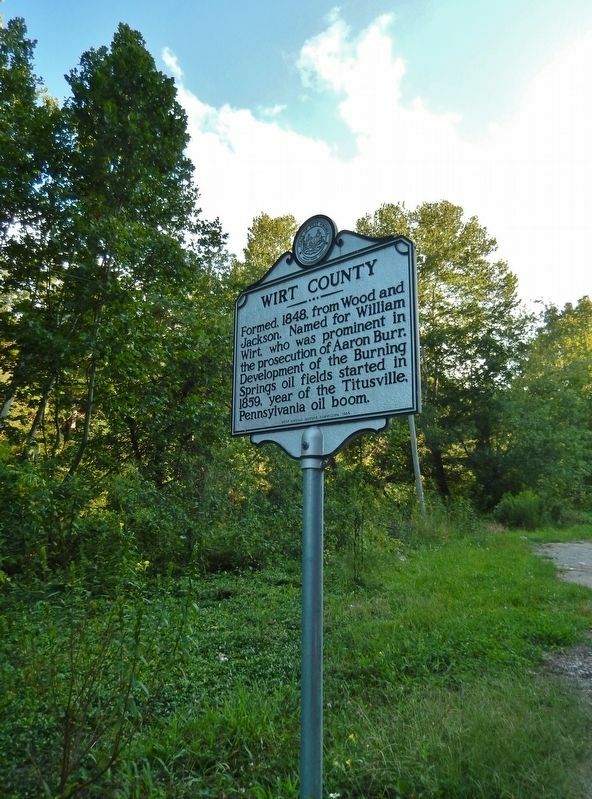 39° 7.857′ N, 81° 17.964′ W. Marker is near Petroleum, West Virginia, in Ritchie County. Marker is on Staunton Turnpike (West Virginia Route 47) one mile west of Cairo-Cisco Road (County Road 15), on the left when traveling west. Touch for map. 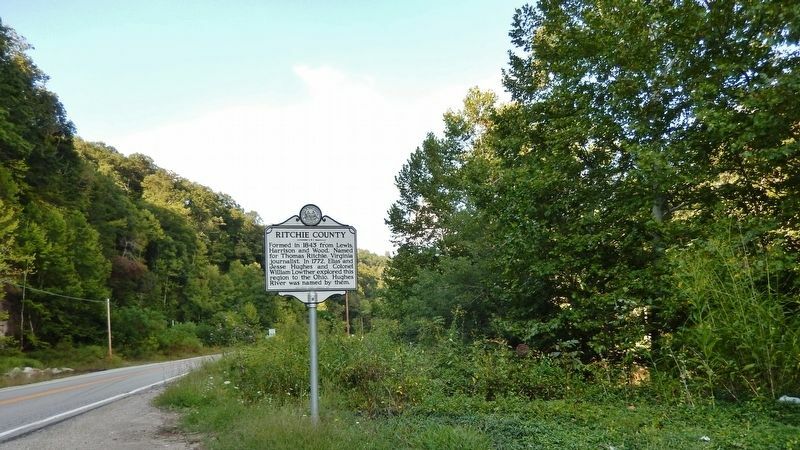 Marker is located in a pull-out on the south side of the highway, just east of the Ritchie County / Wirt County line, in Ritchie County. Marker is in this post office area: Petroleum WV 26161, United States of America. Touch for directions. crow flies. Camp Kootaga (approx. 3.7 miles away); Cairo & Kanawha (approx. 6.6 miles away); Elizabeth (approx. 6.9 miles away); Ruble Church (approx. 9 miles away); Burning Springs Oil Field (approx. 9.7 miles away); Rathbone Well (approx. 9.7 miles away); First County Court (approx. 13.7 miles away). More. Search the internet for Ritchie County / Wirt County. Credits. This page was last revised on February 28, 2019. This page originally submitted on February 26, 2019, by Cosmos Mariner of Cape Canaveral, Florida. This page has been viewed 40 times since then. Photos: 1, 2, 3, 4. submitted on February 26, 2019, by Cosmos Mariner of Cape Canaveral, Florida. • Andrew Ruppenstein was the editor who published this page.